Throughout December, the giving season, we hear a lot about giving and getting involved in worthy charities, but it is also a time of year when we are busy and distracted with other commitments. January is the month for renewal; renewed commitments, renewed energy, renewed focus. 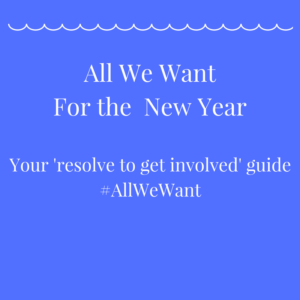 To follow up from our All We Want For Christmas campaign, when we told you about great ways to give, we are excited to introduce a new campaign: All We Want For The New Year. Consider this campaign your New Year’s resolution guide. Do It Yourself: If you are not involved in the nonprofit industry you may not know certain things about how they operate. For example, do you know how much time a nonprofit spends trying to get noticed on social media, without a budget? Getting likes, shares, or better yet, conversations started about an awareness or fundraising campaign takes a lot of time. And then Facebook goes and changes our newsfeeds so we see more family and friends content! Ugh! If there is a cause you are passionate about, find the organizations involved in that cause (possibly use the tool from yesterday’s post), then help them spread their word. Follow, like, share, and engage with what they post. This kind of free advertising can really help a nonprofit out. I hope this list encourages you, whatever your ability, skill, or level of commitment, to participate in the world that lies beyond your comfort zone.